Today I'm grateful to welcome the Unforced Rhythms community to my little space on the internet - Welcome, friends. This past year was a real doozy for me personally, full of all sorts of unexpected ups and downs. 2015 has me feeling glad to embrace something new, ready to look ahead and move on. As I do, though, there are a number of things I will carry with me from 2014 - two, in particular, that I'd like to share with you. The first is that years like the one I had in 2014 have a way of revealing your real friends - periods of sickness and struggle have a way of highlighting who it is that really helps you carry the burden of your own life. These friends, whether near or far, tend to stick around for both the ups and downs, and if you're fortunate to have some very old friendships (as I am) these people bring the extra special gift of knowing your history. Armed with that knowledge they're able to see beyond the present circumstances and remind you of your own story, to tell it back to you when it feels like you've lost your way or run into a dead-end. This is one of the things I see and appreciate in the Unforced Rhythms community which originally grew out of Michelle DeRusha's "Hear it on Sunday, Use it on Monday" link-up before being passed on to Kelli Woodford. As a participant in both link-ups, I've noticed that while there are people who come and go, there's also a core of dedicated people who make up this network of grace-seeking, spirit-listening people. You, my friends, are the "old friends," the ones who know the history and can tell it back to newcomers like myself and who hold the life of the community steady as it waxes and wanes. You've stayed steady, faithful, as we've rounded bends, hit dead-ends and generally journeyed together. Thank you for being here, for your faithfulness, commitment and dedication. Thank you for visiting other links, for commenting and sharing, for praying for each other. This community is more than just a gathering of links and names, more than the digital code that ties it all together - beyond all of that is real flesh and blood, body and spirit that knits it all together. This is a credit to Michelle DeRusha, Kelli Woodford and others who led and made space for community to grow. As I look ahead to hosting this link-up I'd like to again ask for your grace as I humbly make some tweaks and changes. I'm grateful to welcome you here and I want to welcome you in a way that reflects who I am and the core of what I value here at Wild Flowers. Sometime I'll tell you more about that - how I came to be here, how I live and breathe and write here in the midst of a very ordinary life, but for now I want to keep it simple and let you know about something else I learned in 2014 and how I hope that will give us vision and energy as we connect in the year ahead. I'm a dreamer, a planner, a girl with big expectations when it comes to life. But I'm also very limited in all the common ways that make us human - I have less time, less energy, less resources than I think I should. I'm not always able to follow through with my own big ideas - whether for my family, church or professional life. Limits are a gift, though, a reminder of our common humanity and an invitation to embrace the small moments of joy, wonder, grace and even sorrow that fill our daily lives. There are lots of groups, lots of blogs and speakers out there encouraging us to "think big," to "dream" and "extend our reach," in short, to "overcome our limits" and while there are times for stepping out, there are also times for embracing the small things, for observing and savoring the moment. In fact it's the ability to see and savor what is that most often leads to something more. Now that's an interesting invitation. Isn't it possible that when we look for Wonder, we start to see it more and more? That small wonders might pile together on top of themselves into a lifetime of grace? What if we choose to be a community of wonder-seekers who live and write with open hearts looking, listening for the breath of God in every moment, every place, every person? That's my proposal - that we would gather together here each week (or as often as we're able) to share with each other one small moment of Wonder from each of our days. In the weeks ahead I want to invite you to link-up a brief post of about five hundred words or less about a Small moment of Wonder. Will you join me in that, in cultivating a space for and celebration of wonder? Think about it. Pray about it. Let me know what you think. For now, this week, link up what you have done already. But next week and in the weeks ahead, keep an eye out for the little moments of wonder when the very ground you stand on opens up to reveal the Something More your heart is longing for. Then jot it down quickly. Briefly create a little word picture as a way of pressing Wonder deeper into your heart and then stop by and share it with us here. "This community is more than just a gathering of links and names, more than the digital code that ties it all together - beyond all of that is real flesh and blood, body and spirit that knits it all together." Yes...flesh and blood...real community...real relationship. Thank you, Kelly, for taking up the baton! I look forward to continuing to interact with you and others in this community. I'm glad to see you here, Joe and look forward to continuing the journey together! Kelly, I so, so, like this very, very much........ My post this week is linked to something I wrote as a guest somewhere else about 'God in the Yard' by LL Barkat--a 12 week journey of Spiritual Diiscipline--finding God by listening and looking. It has changed my life in every way just about every day and I look forward to sharing the small pictures God gives me. Yay! I look forward to joining you! Thank you for continuing with this community. Blessings! This is full of grace and beauty and everything that draws me to this community, friend. And I love the invitation to be brief. Even to leave a thought unfinished sometimes. That a post itself might only be an "I wonder..." without feeling the need to provide an answer. What freedom there is to be allowed to not know it all. THAT is a community for which there is much need and I'm thrilled to get to be one of the first in line to add my hand to the middle and go all in. I sure do love when God does things like that! Looking forward to getting to know you better here, Karrilee. That's so fun Karrilee - I really look forward to hearing what it comes to mean for you. Wonder isn't my word for this year, but I have a feeling it will have a lot of influence. How wonderful to have this great link-up at your good place, Kelly! 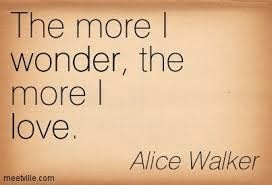 As you might guess from the name of my blog, 'wonder' is a key word for me, in all its definitions. Looking forward to this. Thanks Diana, for stopping by. I know, I thought of your blog just yesterday as I was preparing this. Perhaps you could be our first guest post when you have a spare moment - I'd love to hear more about how 'wonder' has impacted your life! I keep reading and rereading these words, Kelly, and each time they are a breath of fresh air to my soul. Truly. I am grateful for the beauty (and beginnings of friendships for me) of Unforced Rhythms and hopeful for how this beauty will continue deepening as it takes shape through Small Wonder. I love your heart, friend. I always do. And I'm honored to be right here with you. p.s. Next time, I promise, I'll steer for that 500 word or less post ;-D It'll be good for me. "In fact it's the ability to see and savor what is that most often leads to something more." Yes, yes, yes! Thanks, Kelly. I just spent a weekend at a monastery in a silent retreat. The things God reveals in "just being" are amazing! Thank you for agreeing to host us in this space to share our moments of wonder. I do love this community of friends. You're a blessing. Great words here, "Limits are a gift, though, a reminder of our common humanity and an invitation to embrace the small moments of joy, wonder, grace and even sorrow that fill our daily lives."